There is another side to America’s inadequate savings rate, and that is a chronic current account deficit. 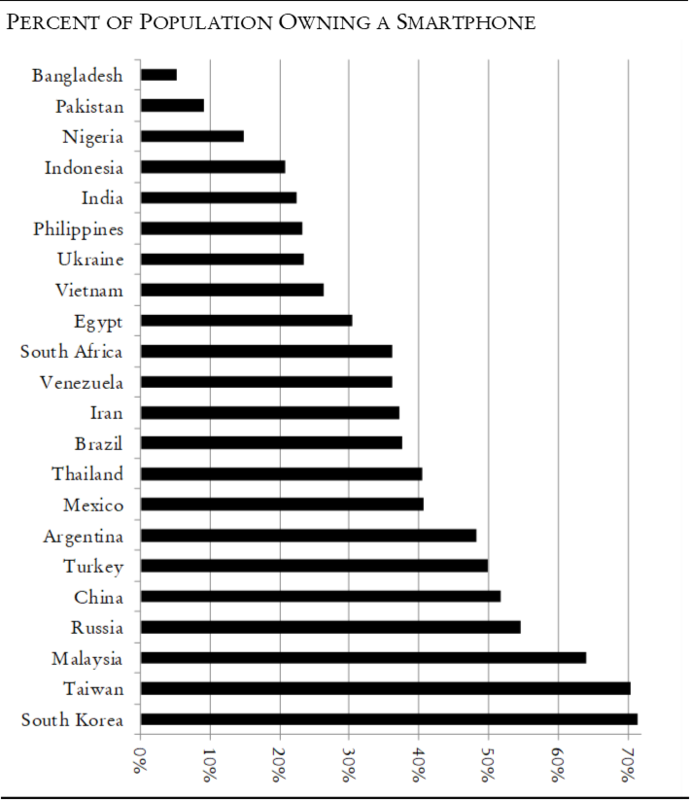 Countries save by exporting more than they import and saving the balance. The economics literature documents the close relationship between rates of aging, savings, and current account balances.3 Older people lend to younger people to fund retirement, and younger people borrow from older people to start families and build enterprises. Countries with a higher proportion of aging people have a greater need for savings, and typically run a current account surplus with countries that have a younger population. The Nobel laureate Robert Mundell is one of the originators of this thesis. Without exports, we cannot save; with a chronic trade deficit, we cannot help but dissave at exactly the point when we require an increase in savings. Thus America is headed towards a catastrophe. Can it be averted? The answer is affirmative, but it will require radical changes in U.S. economic policy. Trade competition from Asia in high-value-added manufactured goods presents a different kind of challenge than we have dealt with in the past. China and, to a lesser extent, other Asian competitors employ the full resources of state finances to fund capital-intensive manufacturing investment in the way that the West subsidizes basic infrastructure. In addition, China will commit $1 trillion to building infrastructure overseas to support its foreign trade, including exports as well as raw material supplies. The problem is not merely the dumping of artificially cheap goods into American markets, but a state-supported capital investment program that erodes returns for American investors. As a result, investment in the United States seeks capital-light venues such as software and avoids capital-intensive sectors such as chip production. We are being shut out of the global market for high-tech exports. By no means should we emulate China, whose model suffers from massive inefficiencies as well as suppression of political and economic liberty. But we do need to beat China at its own game, at least in some respects. Although America should not subsidize capital investment; it should subsidize fundamental research that leads to entrepreneurial innovation. And it should work with India, Japan, and other countries that want to resist China’s bid for Asian economic dominance to create markets for American high-tech exports. There is a noticeable and significant relationship between population age and current account balance (shown in the previous chart as a percentage of GDP). Demographics, to be sure, is not the only determinant of current account surplus or deficit. Given its ranking in terms of age of population, the United States should be in rough current account balance rather than deep in deficit. 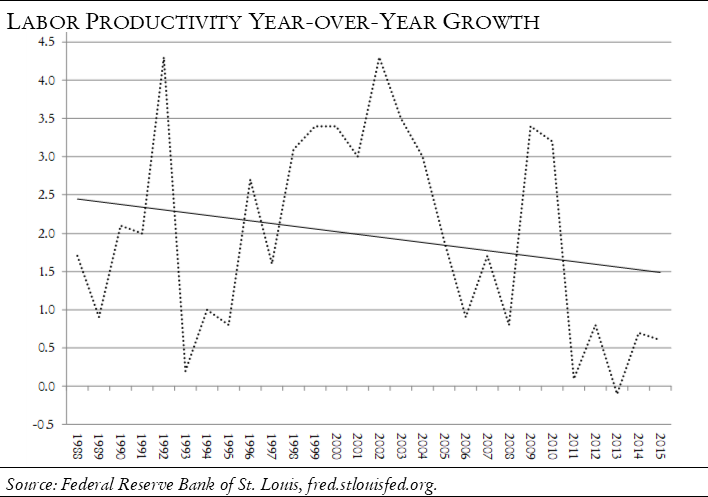 Note, however, that the United States is well below the regression line. Relative to the global norm, our trade deficit is much larger than it should be given our demographic profile. 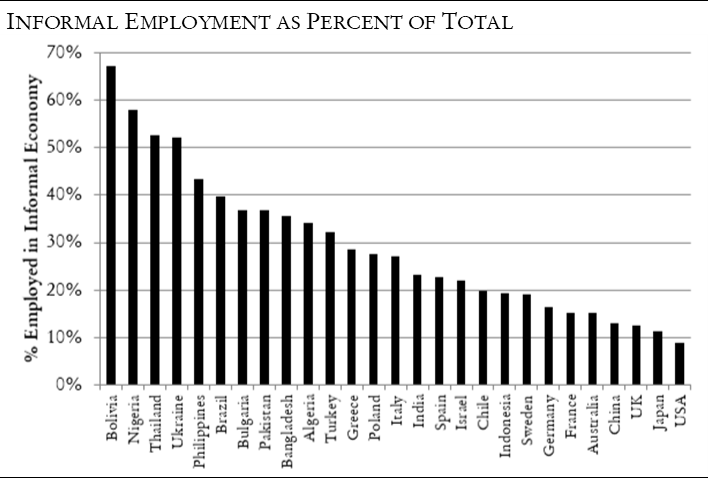 The United States has done more than its share in absorbing the world’s savings. 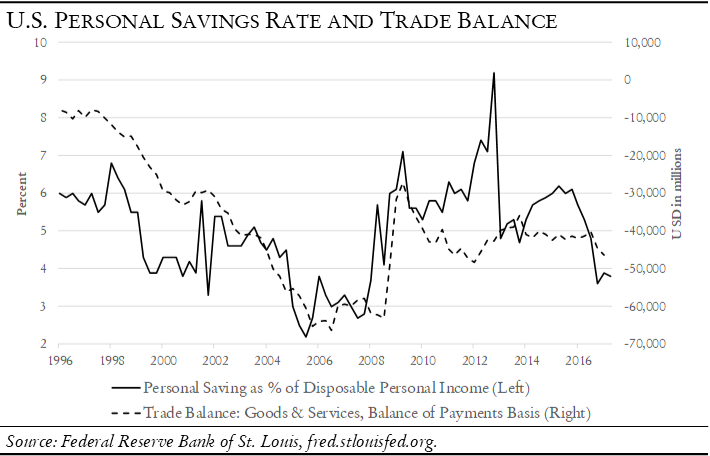 We also observe a fairly close relationship between the U.S. personal savings rate and the trade balance, as in the chart below. America’s low savings rate and trade deficit are two sides of the same coin. Americans consume more foreign products than they export. A significant increase in the global supply of saving—a global saving glut— . . . helps to explain both the increase in the U.S. current account deficit and the relatively low level of long-term real interest rates in the world today. The prospect of dramatic increases in the ratio of retirees to workers in a number of major industrial economies is one important reason for the high level of global saving. However, as I will discuss, a particularly interesting aspect of the global saving glut has been a remarkable reversal in the flows of credit to developing and emerging-market economies, a shift that has transformed those economies from borrowers on international capital markets to large net lenders. The flood of global savings entering the United States kept U.S. interest rates low and fed the housing price bubble of 1998–2008. It surely contributed to the proliferation of financial instruments that later proved toxic to the financial system, above all securitized housing debt with a AAA tag from the major ratings agencies. European and Japanese financial institutions seeking an outlet for savings were eager buyers of this debt. In my experience as global head of debt research for Bank of America during 2002–2005, foreign demand for highly-rated U.S. assets contributed to the financial industry’s disastrous practice of packaging low-quality assets into notional AAAs. The U.S. current account deficit shrank after the global financial crisis and the savings rate rose, although the savings rate is still half its level of the mid-1990s. As the U.S. current deficit grew during the mid-2000s, manufacturing employment fell sharply, from a peak of about 17.5 million to around 13 million before the crisis, and then to 11.5 million after the crisis. The great decline of manufacturing employment, in other words, occurred well before the financial crisis. 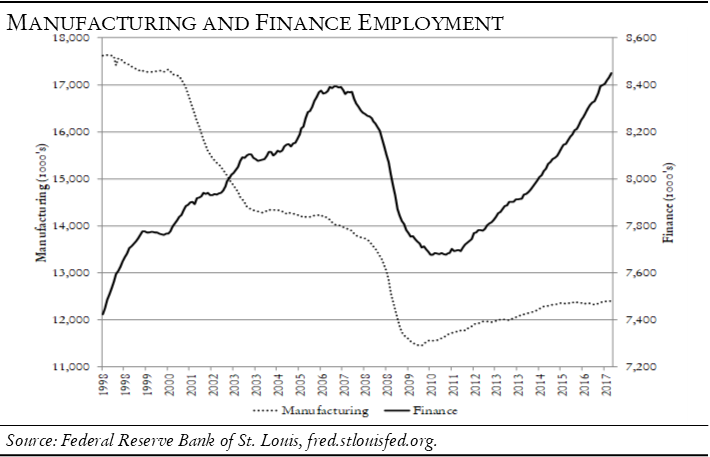 To some extent the impact of declining manufacturing employment was masked by a sharp rise in financial sector employment, mostly in the service of the housing bubble and its financial requirements. Financial sector employment fell sharply after the crisis and has only just regained its previous peak. The trouble is that the whole world is—or at least the productive parts of the world are—all aging rapidly at the same time. The world as a whole is aging less rapidly than its economically advanced sectors only because Africa’s population is growing rapidly and maintaining a median age of around 18 years. South Asia is aging less rapidly than the rest of the world. It is not that the world is short of young people, but that the young people live in zones of extreme economic backwardness without the political stability, infrastructure, governance or human capital to absorb large amounts of foreign investment. There simply are not enough educated young people in economically productive zones with the governance, infrastructure, and skills to absorb the savings of the world’s prospective retirees. As a matter of simple accounting, people must earn more than they consume in order to save. This can be accomplished by reducing consumption, a poor solution since it leads to recession and reduced incomes. It can be accomplished at the national level through a current account surplus. Or it can be done through rising productivity. At present, however, the United States is in no position to do any of these. Labor productivity continues to languish at close to zero growth. Capital investment in the United States, meanwhile, remains low in part because Asian subsidies for capital-intensive industries make it difficult for American industry to compete. 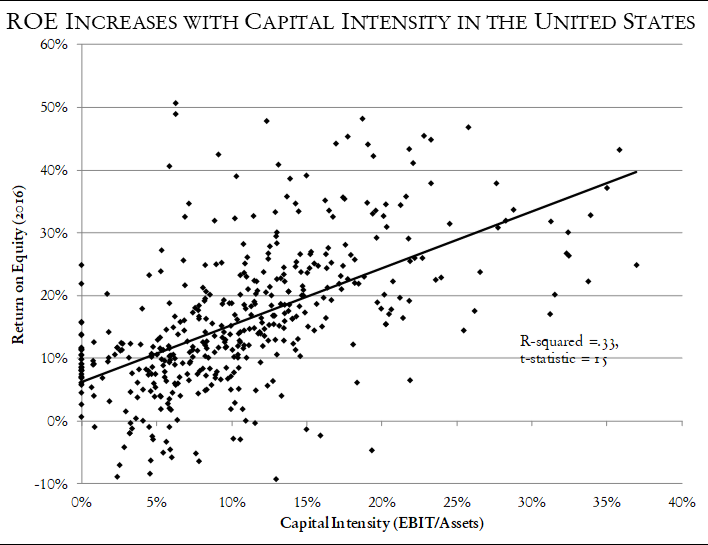 The charts below show the capital intensity (earnings before interest and taxes divided by assets) versus return on equity for the major subsectors of the S&P 500 index (excluding finance and energy) and the MSCI China Equity Index, respectively. Very different rules apply to America and China. 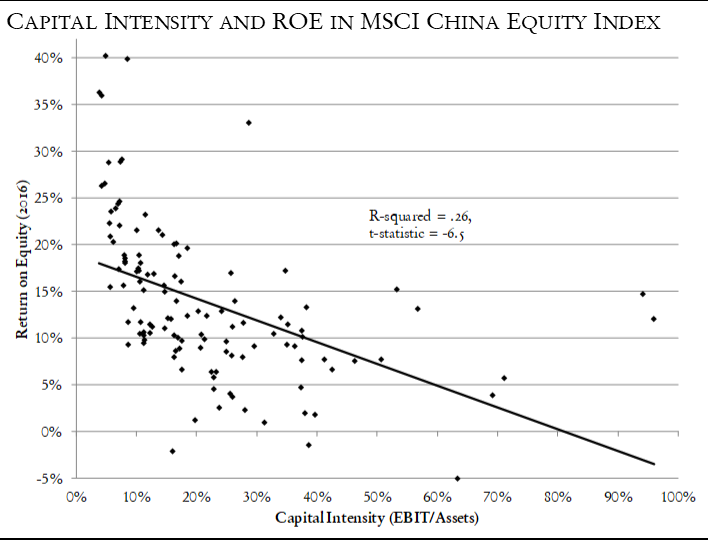 Return on equity (ROE) rises with capital intensity in the United States and falls with capital intensity in China. This is an artifact of Chinese state policy: China treats capital-intensive industries as if they were infrastructure. A semiconductor plant may run at a low profit margin or even a loss, but if it contributes to the greater good of the Chinese economy in the view of Chinese planners, the loss is simply a cost to be absorbed like that of a bridge or a highway. China offers enormous subsidies to capital-intensive industries through low-cost loans from state-controlled banks and other mechanisms. Some of these subsidies keep outdated and inefficient industries operating, such as steel and coal companies in the industrial northeast. Other subsidies give China dominance in new technologies, notably in solar panels. Every important high-tech product in the present economy was invented in the United States: integrated circuits, lasers, optical networks, flat-panel displays, the cell phone, LEDs, solar panels, and so forth. American manufacturers, though, are effectively shut out of high-tech trade. That excludes the United States from playing a major role in the revolution now underway in emerging markets. The great global imbalance, as noted above, is that all the productive sectors of the world economy are aging simultaneously. Aging countries seek to invest in countries with young populations, but the only countries with young populations are inaccessible to the world market and likely to remain so for the foreseeable future. There is enormous room for productivity to grow in emerging markets, however, and that can more than compensate for demographics. The good news is that productivity growth—the mobilization of energy and talent now wasted in the backwaters of the world economy—can bring a billion people into the world market who until now have languished on its fringes. The bad news is that China is far ahead of the United States in learning to transform this boost in human capital into economic alliances and export markets. That is where we need to catch up and overtake China. The steam engine powered the first great revolution in economics, and the smartphone will catalyze the next one. Talent is the scarcest resource in the global economy, and the spread of broadband through the backwaters of the world opens the global market to the talented few. Men and women who till subsistence plots or wait for passersby in market stalls suddenly can sell to the whole world through e-commerce. Capital will find its way into the capillaries of the world economy through e-finance. The backward economies in which most of the world’s people live waste time and grind down the spirit. In so-called emerging markets, between one-third and two-thirds of the workforce spend most of their time doing little or nothing. The proportion of workers outside the formal economy ranges from 32 percent in Turkey to nearly 60 percent in Nigeria. Everyone has hustle, but no one has access to capital, nor rights to property, nor security from the arbitrary intrusion of the authorities. Men work seasonal construction jobs for cash payments and women find things to sell. No one pays taxes, there is no way to collect them, and “informal” workers couldn’t afford them in any case. Governments in turn provide paltry services and accumulate debts. An inbred elite milks the state budget and manages monopolies. China is also investing aggressively to stay ahead of the technology curve. By 2025, IBS estimates, there will be 655 million smartphones operating on the new 5G standard, with an order of magnitude greater download speed than existing smartphones. The impact of extremely fast mobile broadband on a variety of industries will be earth-shaking. Of these 655 million 5G phones, IBS adds, 431 million will be manufactured by Chinese companies. “In addition to the 5G smartphone market, China will be the leader in establishing 5G communications infrastructure. There is the potential for over two million 5G base stations in China in 2022,” IBS adds. The good news is that the prospects are good for a quantum jump in productivity in the developing world. The bad news is that China is acting aggressively to position itself as the dominant equipment supplier, investor, joint venture partner and technology provider in this revolution. By contrast, the United States is drifting towards the export profile of Brazil, with strength in agricultural commodities and energy but overall weakness in high-technology manufacturing and exports. 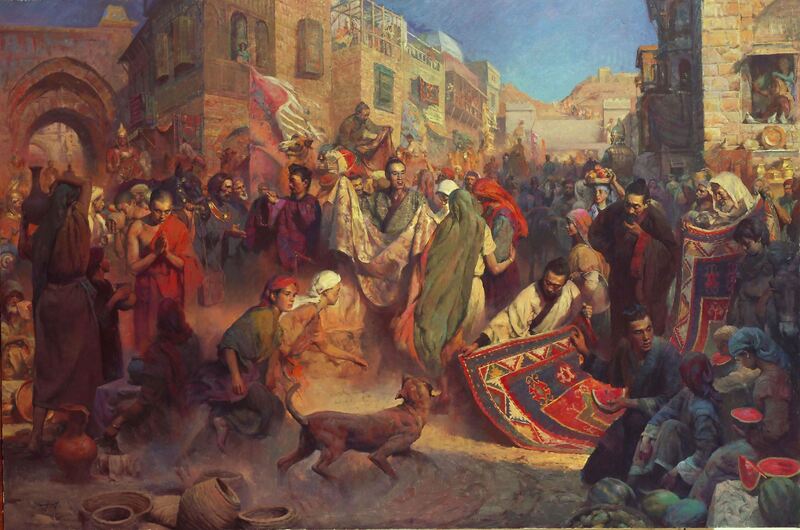 America’s problems are so grave that trade protection will do little to solve them. American innovations gave us the high-tech manufacturing industries that China now dominates, and the ultimate solution is to create new industries that make the existing investment opportunity set obsolete. Some ambitious steps are a prerequisite for overtaking China. First, the government cannot sit on the sidelines while China massively subsidizes its own industries. I do not propose that we copy China’s policy of directly subsidizing industries we think desirable; this leads to enormous waste and inefficiency, as well as corruption. But the U.S. government should fund basic research into new physical processes and technologies under the aegis of the Defense Department and NASA, as it did when John F. Kennedy promised a moon landing and when Ronald Reagan promised to build a missile defense system. I elaborated such a policy in my essay “The Digital Age Produces Binary Outcomes,” in this journal (Vol. I, No. 1). Second, the United States must refocus education subsidies on STEM training, as it did after the 1957 Sputnik launch. 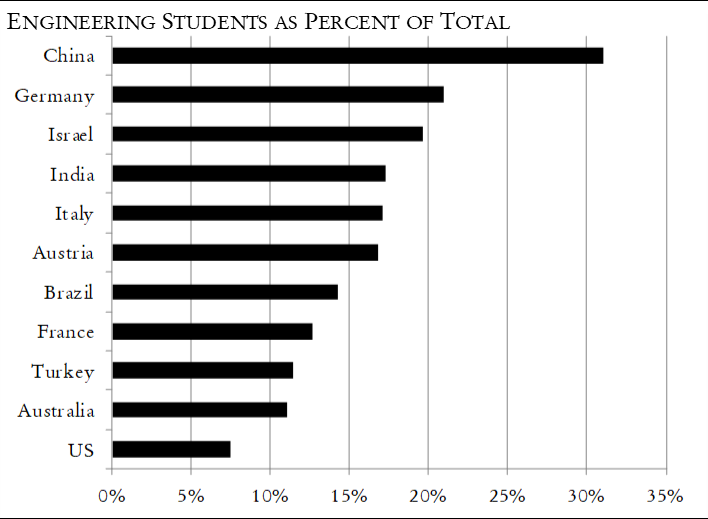 Only 8 percent of American undergraduates choose engineering as a major, compared to more than 30 percent in China (which now graduates four times as many engineers as the United States). Third, the United States should use a range of measures to force parts of the high-tech supply chain back to the United States. A first step would be to require 100 percent American content for semiconductors, flat panels, sensors, and other key components of defense equipment. That will raise the cost of defense goods considerably, but it is a measure justifiable on national security grounds alone, and will repatriate key elements of high-tech production.9 Other measures to prevent American innovations from migrating to production lines elsewhere will be required. It won’t quite be Ricardian comparative advantage, but that’s the way the cards lie. Fourth, the United States should compete head to head with China for predominance in the communications and information revolution now underway in the developing world, especially with countries that look with dismay at the growth of Chinese power—for example, India, now the world’s most populous country. China’s One Belt, One Road program does not guarantee its success in high-tech trade. There are some sectors in which it may be in our interest to cooperate with China, but many others in which competing institutions, for example the Asian Development Bank, can offer effective competition to Chinese influence. The United States and Japan are natural partners for this kind of enterprise. With a rapidly aging population and net foreign assets of $3.12 trillion as of the end of 2016, Japan needs high-return investment opportunities. 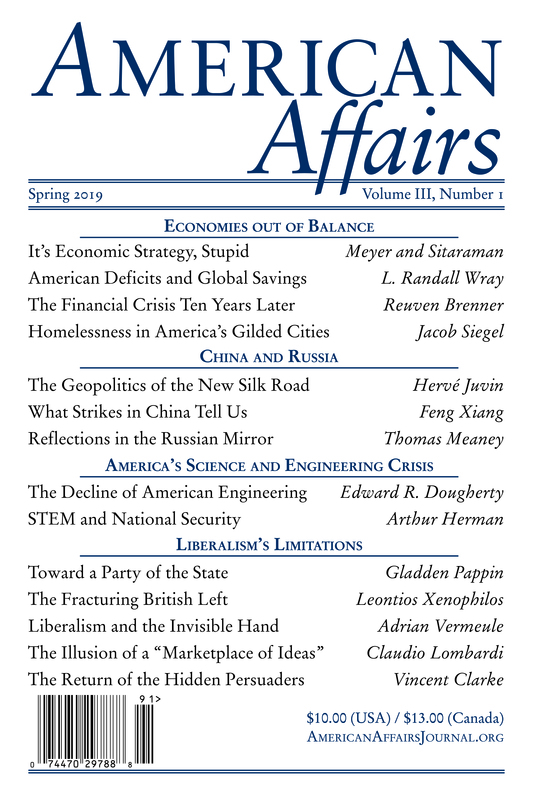 This article originally appeared in American Affairs Volume I, Number 3 (Fall 2017): 31–44. 1 “A Summary of the 2016 Annual Report,” Social Security and Medicare Boards of Trustees, 2016, https://www.ssa.gov/oact/trsum/. 2 Kathleen Elkins, “Here’s How Much the Average American Family Has Saved for Retirement,” CNBC, Sept. 12, 2016, https://www.cnbc.com/2016/09/12/heres-how-much-the-average-american-family-has-saved-for-retirement.html. 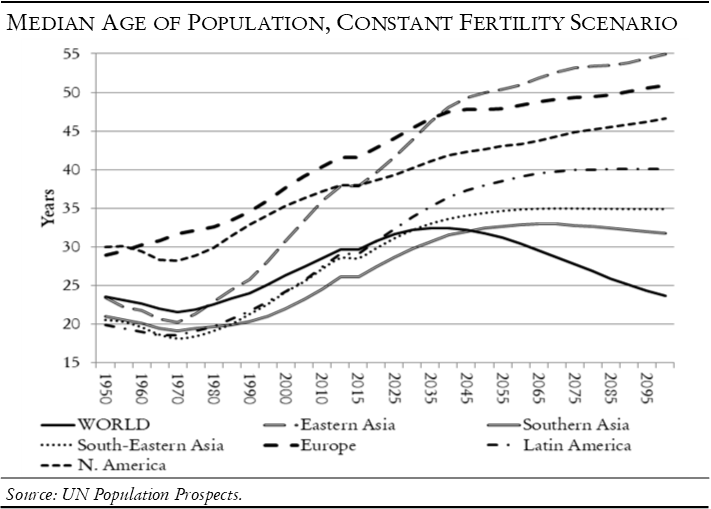 3 See Robert Mundell, “The International Distribution of Saving: Past and Future,” in World Saving, Prosperity, and Growth, ed. Luigi Paganetto, Mario Baldassarri, and Edmund S. Phelps (New York: Macmillan, 1993). 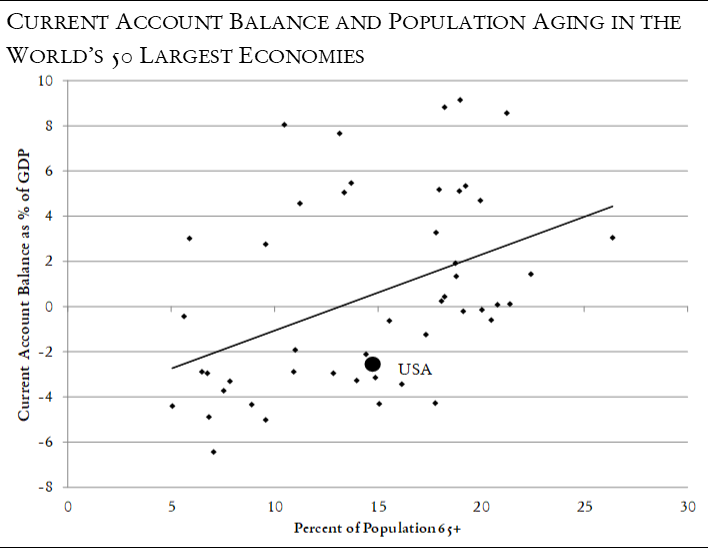 See also, for example, Ralph C. Bryant, “Demographic Influences on Saving-Investment Balances in Developing and Developed Economies,” Center for Retirement Research at Boston College, April 2007, http://crr.bc.edu/wp-content/uploads/2013/07/wp_2007-08-508.pdf; and Matthew Higgins, “Demography, National Savings, and International Capital Flows,” International Economic Review 39, no. 2 (May 1998): 343–69. 4 Dr. Henry Kressel, formerly head of RCA Labs and the senior partner in the technology practice of Warburg Pincus, described the case of solar panels in an unpublished speech delivered at Columbia University Business School in 2016. 5 International Business Services Semiconductor Industry Report, June 2017. 6 Suwatchai Songwanich, “China’s Race to a Cashless Society,” http://www.bangkokbank.com/BangkokBankThai/Documents/Site%20Documents/China%20Articles/Update/2016/Chinaweek2016_17.pdf. 7 Burnmark, “Cashless Turkey by 2023,” May 2017, http://bkm.com.tr/wp-content/uploads/2017/05/cashless-2023.pdf. 8 Li Heshun, “National Broadband: A Complex Undertaking,” Communicate (Oct. 13, 2013), http://www1.huawei.com/enmobile/about-us/communicate/issue/hw-314202-hw_314246-196981-196943-hw_314236.htm. 9 See Henry Kressel and David P. Goldman, “America Can Invent the Next High-Tech Jobs,” Wall Street Journal, Nov. 21, 2016, https://www.wsj.com/articles/america-can-invent-the-next-high-tech-jobs-1479776168. David P. Goldman is an economist and critic known for his series of online essays in the Asia Times under the pseudonym Spengler. He is the author of How Civilizations Die (and Why Islam Is Dying Too) (Regnery, 2010). Formerly, he headed fixed income research at Bank of America. He is a member of the board of Asia Times Holdings.